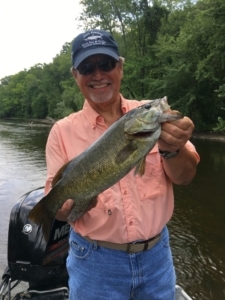 Mark, from IL, holds a very nice Muskegon river Smallmouth bass caught yesterday. The Muskegon river fishing report for July 17, 2018 in the Newaygo, Michigan area comes with a bit of concern for the “health” of the river due to low water levels and extreme heat we’ve had in Michigan recently. With very little measurable rain in the Muskegon river watershed over the past few weeks from the Stanwood area, NE towards Evart and the center of the state, river levels are LOW. At it’s lowest point last week, it was just above 800 cfs in the Newaygo area, with normal being closer to 1,300 cfs and this, coupled with hot days and warm nights, found day time river temperatures in the low 70’s near Croton dam. Click HERE for current Muskegon river water levels and conditions. All that said, we are still getting Smallmouth bass and the occasional Rainbow or Brown trout, with the use of both fly fishing and light spin tackle equipment. Depending on the day and water levels at the time of launching, we’re fishing in/around the Newaygo area for the most part, but venturing 10 miles down river when conditions allow as this finds less recreational traffic. The topwater “bite” has been pretty good, considering how goofy river conditions are and for the fly fisher looking to get into surface feeding fish, this is your best bet ! Click HERE for to read more about summer angling on the Muskegon river. Present water temperature in the Newaygo area between 69-72.